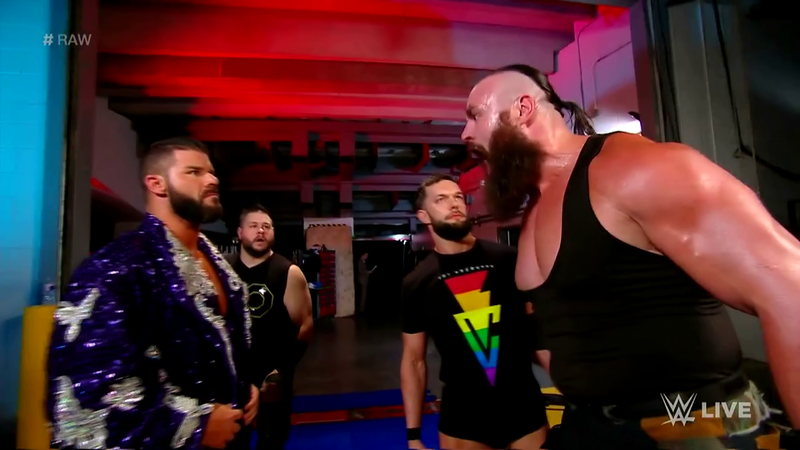 Although it’s not 100% clear, one assumes that Braun Strowman did not in fact know that Kevin Owens had spent the last two and a half hours trying to build a small army to go against him when he came over to casually suggest that Balor and Club team up against him. That Kevin doesn’t know for sure either leads to him going full KO and standing just far enough way to get in what he can without exposing himself too much Strowman in a single sitting backstage. Owens plan to destroy Strowman by frog splashing him through a table works about as well as The Miz’s dumpster truck idea, mostly just succeeding in making Braun angry. Though he is absolutely not the first person to be able to get up after being frog splashed through a table, he may be the one most likely to turn that into a trope of his own. In fact, I’d go so far as to say that if they ever actually get Braun to become the star the company seems to want to eventually position as, the Last Man Standing match will be what he used to take the title of franchise player from John Cena. There’s not been a man better suited for a gimmick since Coffin McGillicutty’s run of casket matches in 1980s NWA Mid-South.